Over the course of the last two decades, amidst the ascendance of nationalist extremism in Israel, the fraudulence charge has grown ever stronger among the Jewish right-wing public. Screenshot Facebook post by Prime Minister of Israel, May 7, 2017. Among the numerous ideological affinities and governing styles shared by Trump and Israeli Prime Minister Benjamin Netanyahu is a commitment to the rhetoric of ‘fake news.’ In the last year, Netanyahu has increasingly borrowed this Trumpian formulation in an attempt to quell dissent and undercut critical Israeli and international media scrutiny. Of course, Netanyahu is not unique in this regard. Over the course of the last year, authoritarian regimes across the globe – including Syria, Russia and Malaysia – have adopted the fake news script to silence detractors and critics, frequently in response to the charge of human rights violations. But while the global scale of this accusation may be unprecedented, charges of fake news have a long history, considerably preceding the Trump era. In Israel, the accusation of fraudulence, employed against political critics and foes, can be traced to the onset of the Zionist settler-national project. As postcolonial studies show, the repudiation of indigenous claims (to history, land, humanity and so on) was a foundational logic of colonial projects, enabling the violence of colonialism in its various forms. This formulation was also at work in the history of Zionism and has had a lasting hold on dominant Israeli ideology. Over the course of the last two decades, amidst the ascendance of nationalist extremism in Israel, the fraudulence charge has grown ever stronger among the Jewish right-wing public as a popular means of indicting critics and undercutting Palestinian claims, particularly where Israel’s military occupation is concerned. Video footage of Israeli state violence against Palestinians has been a favorite target of this accusation – footage shot by international journalists and human rights workers and increasingly, as cameras have proliferated in the West Bank, by the cameras of Palestinians living under occupation. It was in the language of fake news that Israelis famously responded to the killing of twelve-year-old Mohammad al-Dura by the Israeli security services in 2000, in the early days of the second Intifada. His killing was filmed by French television and was replayed around the world in the aftermath of the event, becoming no less than a viral global icon of the Israeli military. What ensued was an organized campaign by the Israeli right wing, and their international supporters, to debunk the images as fake. 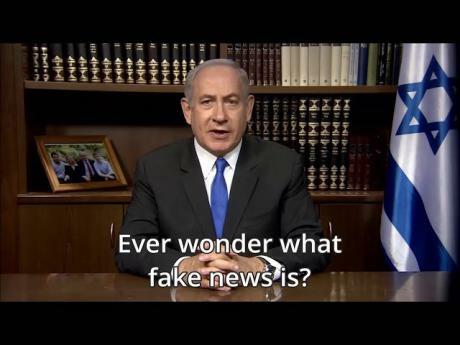 Netanyahu convened an Israeli government committee of inquiry in 2012 to investigate the incident, and the committee eventually endorsed the popular discourse of fakery, blaming manipulative editing for falsely producing the damning images. The state committee did more than exonerate the Israeli security services in al-Dura’s death; indeed, they argued that he was not actually dead. Right-wing Israeli newspapers put it succinctly in their headlines: “Mohammed al-Dura: The Boy Who Wasn’t Really Killed.” Pleas by the al-Dura family to exhume the boy’s body were declined. The state committee did more than exonerate the Israeli security services in al-Dura’s death; indeed, they argued that he was not actually dead. Despite the Israeli response to the al-Dura affair in 2000, it would take nearly two decades for this argument about Palestinian fakery to become commonplace where video evidence of Israeli state violence is concerned. By 2014, amidst the ascendance of far-right politics in Israel, and the threatening spread of cameras among Palestinians living under occupation, the argument finally gained a mainstream foothold. For example, the charge of fake news would predominate in Israel following the killing of two Palestinian youths in the West Bank town of Bitunya in 2014, fatally shot by the Israeli security services during an annual demonstration commemorating the Nakba. The military denied responsibility, claiming that their forces had only used non-lethal rubber bullets that day, in compliance with regulations governing engagement in protest contexts. But the scene had been filmed by numerous on-site cameras, including four security cameras, and those of CNN and a Palestinian photojournalist. The Israeli human rights organization B’Tselem took on the case, believing that the unusually high volume of associated footage conclusively established military responsibility for the deaths. But mainstream Israelis felt differently, and the volume of footage from Bitunya did little to persuade them of the military’s responsibility. To the contrary, the videographic evidence fueled a widespread repudiation campaign. State actors and institutions were among the first to join the fake news chorus, including the defense minister, the foreign minister and official military spokesmen. But mainstream Israelis felt differently. All argued that “the film was edited and d[id] not reflect the reality of the day in question.” Their assertions were parroted by the national media, who insisted that the shootings were “staged and faked.” That accusation was then picked up by right-wing Israelis and supporters internationally. Some focused on the image of the falling body, arguing for its self-evident theatricality (yet another case of what some called “Pallywood” – the purported Palestinian Hollywood-like industry in manufactured images of Palestinian victims). Others claimed there was a lack of adequate blood in the footage, proof that the victim had not been killed. Most proponents of the fraudulence charge did not dispute the deaths themselves, as they had in the al-Dura case, but focused on exonerating the IDF through a re-reading of the footage, arguing that the bullets had come from other sources. The charge of fraudulence haunted the case as it wound its way through the Israeli legal system. The Bitunya case established the fake news charge as a default Israeli script for responding to videographic evidence of state violence against Palestinians. A few months hence, during another violent Israeli military incursion into the Gaza Strip, Prime Minister Netanyahu would famously rehearse a variant of this discourse when he accused Gazans of performing their deaths for the media: “They want to pile up as many civilian dead as they can. They use telegenically dead Palestinians for their cause.” The language of “fake news” had moved from the margins of the conspiratorial blogosphere to become the language of state – presaging a dynamic that we would watch unfold in the US in the Trump era, a few years hence. State actors and institutions were among the first to join the fake news chorus, including the defense minister, the foreign minister and official military spokesmen. For Israelis who support the fake news accusation, the stakes are considerable – just as they are in Trump’s America for those who parrot this rhetoric. In the Israeli context, these accusations aim to protect the image of Israel by stripping Palestinian victims and Israeli perpetrators from the videographic scene of the alleged crime – and to do so in a way that removes all traces of repressive Israeli military rule and its histories. The charges of fraudulence, forgery or Palestinian theatrics are an attempt to correct the record, to right the wrongs done by a libelous Palestinian public that is intent on Israel’s defamation by means of fictive image-making – or so many believe. In this way, the discourse of fake news is just another tool in the Israeli struggle against the so-called existential threat. This article was originally published in Middle East Report, Issue 283.